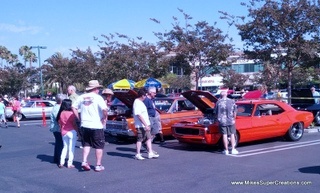 I finally checked out Supercar Sunday in Woodland Hills, Ca. This week its marque was Muscle Cars, so I took the blown Camaro and had a perfect 22 mile ride from Camarillo to Woodland Hills at 6:45am. Weather was just perfect for the drive. About 65 degrees (F) going and 75+ degrees (F) on the return. Coming back the supercharged car ran at 185 degrees while maintaining 65-75mph the whole way. Supercar Sunday is the only weekly car show in the world that offers such amazing automotive diversity and passion. From the rarest and most exotic cars from the world over, to the hottest hot rods, muscle cars, imports, “one offs” and just about everything else, they all visist Supercar Sunday weekly. Supercar Sunday illustrates the passion of the automobile and amazing camaraderie of the automotive community. At Supercar Sunday you never know who will attend and with what; From celebrities to race car drivers to designers to us regular guys, at Supercar Sunday is always full of surprises. It is the place to be see and be seen if you are an automotive enthusiast.